Congratulations to the Tennessee Vols baseball team. The Vols took 2 out of 3 from LSU this weekend in Baton Rouge, winning the series from the Tigers. Wins at Alex Box Stadium have been rare for Tennessee. This weekend’s two wins were just the fourth and fifth wins at LSU in school history and the series win was the first ever. James Adkins was amazing on Friday. His line: 3 hits, 1 earned run, 14 strikeouts, and a complete game. The win pushed his record to 5-6 on the year and lowered his season ERA to 2.83. 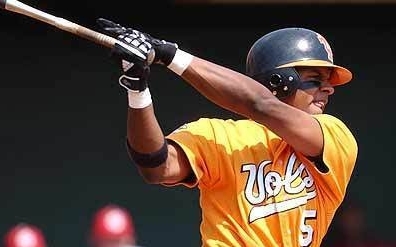 In the process, he became Tennessee’s all time leader in strikeouts. Adkins 14 strikeouts on the night gives him 103 on the season and 350 in his career. That is 5 more than R.A. Dickey, the previous record holder, recorded in his career at Tennessee from 1994 until 1996. Saturday was the Vols sole loss of the weekend, but it wasn’t without some positive. It was apparent that starting pitcher Craig Cobb didnâ€™t have his best stuff, allowing 3 runs in just 2 innings. Rod Delmonico opted to pull Cobb for Nick Hernandez and it paid off. Hernandez pitched very very well. In 6 innings of relief he only allowed 1 run. It wasnâ€™t quite good enough as the offense could only muster 2 runs. LSU beat Tennessee 4-2 to even the series. No career marks were set on Sunday as far as I know, but the game was just as exciting. It took 10 innings for Tennessee to finish the deal 10-8 thanks to a 2 RBI single by Julio Borbon. Aaron Everett finished the final 5 2/3 innings to earn his second win on the season. With the two wins, Tennessee improved to 25-19 (8-11 SEC) on the year. They will play Mississippi at Lindsey Nelson Stadium this weekend. Friday’s game begins at 7:00 pm. Freak | @vol_freak Lifelong Tennessee native and founder of VolNation.com (2003). Freak is the self-appointed "Grand Poobah" of VolNation and writes on all things relating to the Tennessee Vols.